How Much Money Does Smoking Cost You? If you are a smoker, you are undoubtedly aware of the harmful impact smoking has on your health. The warning labels on cigarette packages may be white noise to you, but you know they’re there, and you’re probably well aware that smoking can lead to heart disease, lung cancer, and other smoking-related illnesses. And as damaging as smoking can be to your health, it also has a considerable negative effect on something else — your wallet. Plunking down a few dollars for a single pack of smokes may seem harmless, but the cost of maintaining this habit long-term is anything but. How Much Do You Spend on Smoking? According to the Centers for Disease Control and Prevention, the average cost of a pack of cigarettes is $6.28, which means a pack-a-day habit sets you back $188 per month or $2,292 per year. Ten years of smoking comes with a $22,920 price tag. But depending on where you live, you could be paying much more. While $6.28 represents the average cost, prices reach well above that in areas where cigarettes are subject to a higher state tax as well as local tax. For example, smokers in New York City shell out as much as $10.56 per pack, which amounts to $317 per month, $3,854 per year, or $38,540 over ten years to sustain a pack-a-day habit. If you’ve never calculated the cost of your smoking, you may be shocked to find out what it adds up to over an extended amount of time. Use this calculator to figure out what you spend in a week, month, and year, as well as over 10-year and 20-year periods. While using electronic cigarettes is touted as being less expensive than smoking, the cost of vaping as well as using smokeless tobacco products also add up to significant amounts. If you engage in those habits, it is worth taking a look at what your monthly, yearly, and long-term expenses amount to. Are You Smoking Away Your Future? While smoking is a powerful habit, consider what you are sacrificing it for. Could the money you allocate to cigarettes be put to better use by saving it, funding college for your kids, contributing to retirement, or even spending it on a needed purchase or a vacation? Going back to the average annual cost of a pack-a-day habit, if you chose to invest the $2,292 each year over 20 years instead of smoking it, you would accumulate over $100,000 (before inflation) based on an annual market return of 7 percent. Make that around $170,000, if you’re paying New York prices. Each time you make a cigarette purchase, you are deciding between funding your future or funding a habit that harms it. Of course, the expense of smoking goes further than just the price of a pack of your favorite brand. 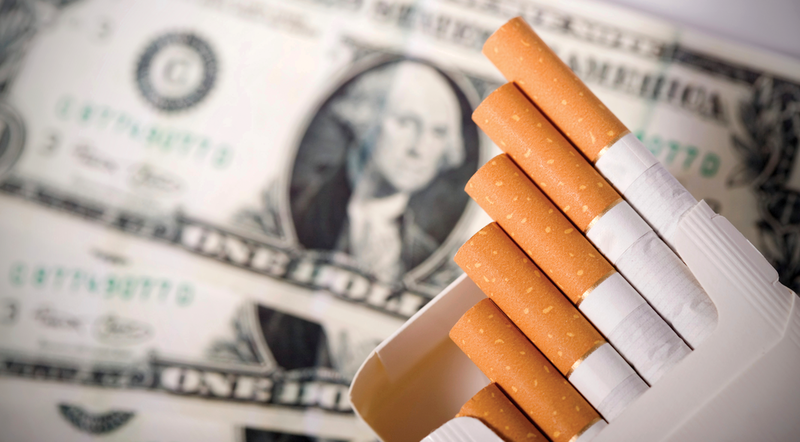 It’s estimated that every pack of cigarettes you smoke carries an additional $35 in health-related costs. Smokers also have to navigate higher premiums for life insurance as well as other ancillary expenses like dental hygiene; increased cleaning costs of homes, cars, and clothing; and lower resale values of property. Take into account the costs associated with lost productivity while at work or smoking-related sick days, and the financial impact of this habit begins to amass greatly. The costs of little things add up. In the case of smoking, the costs not only add up, but they also bring additional expenses and other negative consequences. Again, the grip of smoking is tough to break, but you have a lot to gain — both financially and otherwise — by kicking the habit. Fortunately, there are several resources at your disposal to help you begin the process of quitting.